Injection moulded from polypropylene co-polymer resin, this anti-siphon bottle trap come with inlet of 11/2" bsp connection. 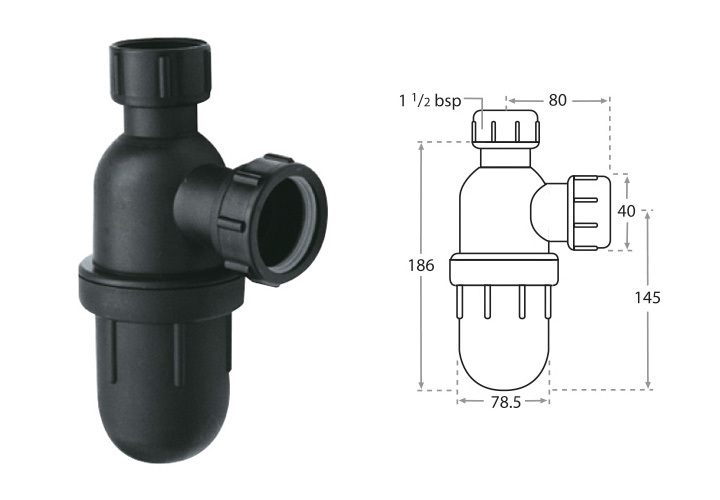 Injection moulded from polypropylene co-polymer resin, this bottle trap inlet is adjustable, 40mm to 100mm to accommodate varying height differences for connection to outlet. Suitable to be used with Vulcathene or equivalent chemical waste discharge pipe system. MT 2300 is injection moulded from polypropylene co-polymer resin, this dilution recovery trap has a capacity of 2.3 litres. Injection moulded from polypropylene co-polymer resin. This trap has a capacity of 2.3 litres and an adjustable inlet to accomodate varying height connection of the outlet. Suitable to be used with Vulcathene or equivalent chemical waste discharge pipe system. Injection moulded from polypropylene co-polymer and available in various sizes to match different outlet sizes. Supplied with back-nut and rubber washer. Available in 70,73 and 85mm diameter. The wastewater from sink is piped to a gully trap before emptying into the sewer. Gully trap is a basin in the ground with a water seal to prevent foul odours of the sewer reaching the surface. Gully traps are buried in the ground with the tops or surround raised above ground level to prevent ground water entering into the sewer.